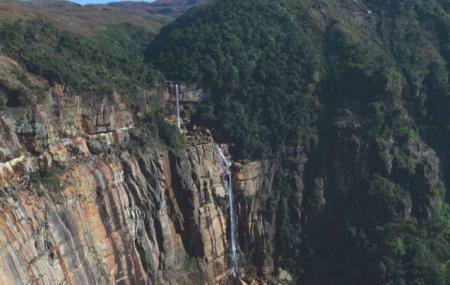 One of the many waterfalls that grace Cherrapunji, the Wakaba falls is a tiered one that is close to 170-190 m in height and provides a mesmerizing panoramic view of the surrounding canyon all around its vista. Located between Shillong and Cherrapunji, the beauty of this fall comes alive during the monsoon months as the garrulous water makes its way through huge boulders and vegetation in and around the canyon. Although not as glorious as the Nohkalikai Falls, this fall is still a must visit as you make a visit to Cherrapunji. Hire a taxi from Cherrapunjee city. Love this? Explore the entire list of places to visit in Cherrapunji before you plan your trip. Fancy a good night's sleep after a tiring day? Check out where to stay in Cherrapunji and book an accommodation of your choice. How popular is Wakaba Falls? People normally club together Sweet Falls and Khasi Monoliths while planning their visit to Wakaba Falls.